Gary Sanchez‘s two-month intro to the Major Leagues in August 2016 was the kind of performance that had not been seen in quite some time, especially for a catcher. With the Yankees stumbling, Brian Cashman decided to add the slugging backstop to the roster to try to infuse some life into the struggling ball club. Sanchez became an instant rock star. The rookie set records for the fastest player to reach 11, 18, and 19 home runs in his initial season. In just 53 games, Sanchez produced 20 HR and 42 RBI to go along with a .299/.376/1.032 split. He finished second in the AL Rookie of the Year voting to Detroit’s Michael Fulmer. Sanchez followed up his rookie campaign with an All-Star sophomore season. He slugged 33 home runs, drove in 90 runs and produced a .278/.345/.531 slash line. He captured his first Silver Slugger Award as the AL’s top run-producing catcher. The second-year player’s season went practically unnoticed because of the one-man wrecking crew named Aaron Judge. “All Rise” was heard around baseball many times as the rookie behemoth slugged 52 home runs, drove in 114 runs and scored 128 runs. Judge captured the Rookie of the Year Award and finished second in the AL MVP voting. Fast forwarding to this season, Judge is having another All-Star season, while Sanchez is struggling mightily. It’s gotten to the point where some fans are calling for him to be traded, or at the very least, to be benched in favor of Austin Romine. Some of these fans that are yelling for Sanchez to go are the same Yankees fans that helped to make Sanchez a rock star two years ago. Romine is one of the best defensive catchers in baseball and his bat has improved greatly, but he is not the hitter Sanchez is and never will be. Offensively, Sanchez is having a miserable season. His .188/.283/.416 splits (.699 OPS) are pitiful. His numbers are even worse against right-handers. About the only positives in Sanchez’s trips to the plate are an increased number of walks and a good performance against the Red Sox this season – .286/.360/.667 in 21 at-bats with 2 HR 8 RBI. Defensively, Sanchez seems to have regressed from his rookie season. Though Fangraphs has him rated as the 7th overall defensive catcher in the AL and 14th overall in the Major Leagues to date, his number of passed balls has been a major problem. He led both leagues last year with 16 passed balls (tied with the Dodgers’ Yasmani Grandal) and has a Major League-high 10 passed balls (tied with the Angels’ Martin Maldonado and White Sox’ Omar Narvaez) already this season. On top of everything else, a groin injury kept him out of action from June 25 through the All-Star Break. After a bad loss to the Tampa Bay Rays Monday night, Sanchez made his season even worse with a seeming lack of interest and hustle on a passed ball and a rally-killing, game-ending groundout. After the game, Aaron Boone said he wanted to review the video before passing judgment on Sanchez’s lack of hustling. But, he did add that Sanchez was not hurt and that “he should be able to get after it”, referring to the passed ball. The subject actually came up prior to the Yankees – Mets game this past Saturday. There were times in the Minor Leagues when Sanchez sulked and/or had his work ethic questioned. That hasn’t been the case since his promotion to the Majors two years ago. The talent is still there. We are only two years removed from shouts of “Release the Kraken!”. We are but months removed from when Michael Kay called him “the best hitter on the team” and many people agreed. So the shouts of “trade the bum!” are absurd. There’s no question that if Sanchez indeed lacked hustle in Monday’s game, he should be benched and read the riot act. But you don’t get rid of him based on a half-season of bad play. You work with him to get him back to where he was offensively and to improve defensively. Amidst the Tuesday morning discussions came word that Sanchez may have re-aggravated his groin injury. 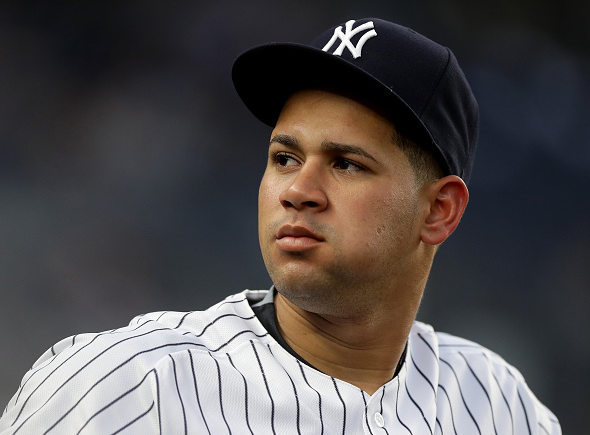 Word is, Gary Sanchez may have re-aggravated groin injury on first inning passed ball last night. He’s getting killed for “lazy” plays but perhaps this explains them. Was afraid to tell team initially because he dreads return to dl. Now will get treatment, try to avoid dl. Yankees’ management has to be sure not to let malaise or a perception of malaise cause Sanchez’s ability and talent to drift away. After all, I know what Sanchez did last Summer…and the one before that too.